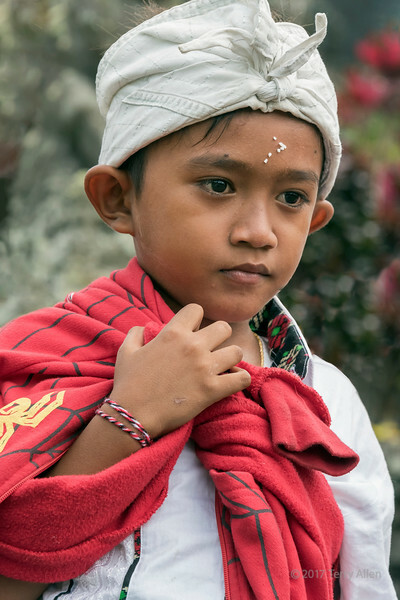 Portrait of a young boy (with permission) on his way down the stairs from the upper terraces at Pura Besakih Hindu Temple complex, Mount Agung, Bali, Indonesia. He is wearing two signs of his religious experience, the wet rice grains on his forehead and the Kalava on his wrist. The Kalva is tied by a priest or an older family member on the wrists of all the people attending the prayer ceremony, on the right wrist of men and unmarried women and on the left wrist of the married women. The cotton yarn is red or red with small bits of yellow. He is also wearing a white udeng and white clothing. For a temple ceremony or anniversary a white udeng or white with a gold thread pattern is traditional. Great portrait of this little boy. Great portrait of this young man. Such a wonderful portrait. This is superb. Lovely portrait! Thanks for the critique...I always appreciate your suggestions and critiques! I love the pose and expression of this young boy.